CCN-World is a reliable single source provider of legal support and business development services for entrepreneurial chefs, top restaurants, and luxury hotels in the gourmet culinary market. We work with clients build their brands, find new business opportunities, and improve the profitability of their businesses. 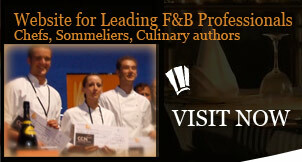 CCN-World is home of Gastronomy by the Seine Global Culinary Summit, and international world series of boutique conferences. > We buzz around the world ! Meet the CCN Team at various professional events throughout the world!